New Delhi [India], Nov. 30 : Coming down heavily on the Centre over the terror attack on an Army mess in Nagrota, Jammu and Kashmir, in which seven defence personnel were killed, former state chief minister Omar Abdullah asserted that regardless of what the Bharatiya Janata Party (BJP) said, Pakistan is no more isolated internationally today than it was six months ago. Abdullah claimed that terrorists were clearly no more deterred from attacking India's armed forces now than they were prior to the surgical strikes conducted in September. New Delhi [India], Oct. 17 : After Bollywood superstar Shah Rukh Khan, former Jammu and Kashmir chief minister Omar Abdullah has complained that he spent two hours in a holding area, adding that this happens to him every time he goes the U.S.
"Another "random" secondary immigration check upon landing in the US. Thrice in three visits, the randomness is growing tiresome now," tweeted Omar. "I just spent TWO hours in a holding area & this happens EVERY time. Unlike @iamsrk I don't even catch Pokemon to pass the time (sic)," he said in his tweet. He further tweeted: "I'm here to speak at an event organised by NYU but I almost wish I'd stayed at home instead. Ah well, that's two hours well & truly wasted!! (sic)"
New Delhi, Jan 9 : Former Jammu and Kashmir chief minister Omar Abdullah on Friday lamented that Governor's rule has been imposed in the state despite a good turnout in the assembly polls and lambasted the People's Democratic Party (PDP) for the latest political development in this regard. "I'm sorry after an election with such a good turnout we have a situation of Governor's rule but as I've maintained the onus lies with @jkpdp," Omar tweeted. "Lastly, if @jkpdp have a govt in place before the 19th of Jan I'll publicly acknowledge that they were right and I was wrong. Let's see now," he added. New Delhi, Jan 6 : Taking a jibe at the pugilist Vijender Singh and badminton ace Saina Nehwal after the duo advertised their names for the Padma Bhushan, former Jammu and Kashmir chief minister Omar Abdullah said it's a great pity that the Indian athletes feel they have to lobby and threaten to receive awards. He took to twitter to express his views in this regard, saying the criteria for the coveted award should be based on merit. "It's a great pity that our athletes feel they have to lobby and threaten to receive awards, criteria based on merit should be all that decides," Omar tweeted. New Delhi, Jan 5 : Former Jammu and Kashmir chief minister Omar Abdullah on Monday raised questions on reported talks between the Bharatiya Janata Party (BJP) and the People's Democratic Party (PDP) regarding government formation in the state. In his tweet, Omar said that when he raised the issue of Armed Forces Special Powers Act (AFSPA), he was accused of playing politics with national security, whereas now the ruling BJP is discussing government formation with the PDP which wants revocation of AFSPA. "So, when I raised AFSPA I was accused of playing politics with Nat Sec. BJP negotiates Govt formation with @jkpdp using AFSPA and that's OK??" Omar tweeted. Srinagar, Dec 23 : Jammu and Kashmir Chief Minister Omar Abdullah on Tuesday won from the Beerwah assembly constituency but faced a defeat at the hands of People's Democratic Party's Ashraf Mir in Sonawar. It was earlier reported that he has lost from Beerwah as well following which the Chief Minister tweeted and asked the media to get its facts right. "Dear @IndiaToday please don't be so quick to write my political obituary. Request you check Beerwah result again. Thank you," tweeted Omar. Earlier today, Omar congratulated PDP's Ashraf Mir. Srinagar, Nov 26 : Jammu and Kashmir Chief Minister Omar Abdullah said on Wednesday that he wanted issues between India and Pakistan to be resolved at the earliest. "We have always been in favour of talks. Now, whether talks (between Modi and Sharif) will happen or not, that can only be decided by the Prime Ministers of both nations," said Abdullah. "If asked, people of Jammu and Kashmir have always wanted the talks to take place, and also, want an end to the cross border terrorism and ceasefire," he added. Srinagar, Nov 20 : Jammu and Kashmir Chief Minister Omar Abdullah on Thursday hit back at PDP chief Mehbooba Mufti over her remark that he wielded a broom to please Prime Minister Narendra Modi, saying nobody forms a government on the back of sweeping a road. Attempting to silence all critics, Omar said he was not nominated by Prime Minister Modi, but by actor Salman Khan for the 'Swacch Bharat Abhiyan'. Srinagar, Oct 21 : Commenting on the 'Million March' that is to take place next week in London, Jammu and Kashmir Chief Minister Omar Abdullah on Tuesday said that he does not have an issue with it but the marchers should protest in India rather than by sitting in cosy capitals. "I have no problem propounding an ideology, but rather than sitting in cosy capitals like London they should come here and do it," said Abdullah. Thousands of people are expected to participate in the 'Million March' a calling for independence of Jammu and Kashmir that is scheduled to take place in London on October 26 to protest against supposed 'human rights violations in Indian Kashmir'. Srinagar, Aug 11 : Jammu and Kashmir Chief Minister Omar Abdullah today said that ceasefire violations have nothing to do with elections or August 15.
" Ceasefire violations keep on happening but it has nothing to do with elections or August 15. The leaders of both the countries need to solve this issue together," said Abdullah. "The focus should rather be on the people in Kashmir as such violations create a lot of difficulties for the people living near the border," he added. Srinagar: Jammu and Kashmir Chief Minister Omar Abdullah on Tuesday said he would take up the issue of ceasefire violations from across the Line of Control (LoC) with Prime Minister Narendra Modi during the latter's visit to the state later this month. "We have taken up the matter (ceasefire violations) with the Centre. Prime Minister is paying a visit to Kargil and Leh this month and if I get a chance, I will discuss the issue with him," Omar told reporters here. The Chief Minister said it was the endeavour of the state government to make sure such violations do not have much impact on the people living near the LoC. Karachi, July 26 : While sending Eid greetings to Muslims this year, Taliban leader Omar Abdullah has reportedly said that Taliban does not want to interfere with the internal affairs of other countries. Urging fighters to protect Afghanistan's borders in a statement released on Friday, Abdullah assured the neighboring countries and the world that Taliban only aims to build an independent Islamic regime in Afghanistan and does not intend to harm any other nation, The Express Tribune reported. Srinagar, July 24 : Jammu and Kashmir Chief Minister Omar Abdullah on Thursday said that for some people the appropriate time to revoke Armed Forces Special Powers Act from Jammu and Kashmir will never come even if there total peace in the state. "It is ongoing discussion with the Central Government. Earlier it was the UPA Government and now it is the NDA Government. For some people the appropriate time to revoke AFSPA will never come. They are so fond of such laws that even if there is total peace here and no incidents of violence are reported, then also they will come up with some reasons so as to continue such laws," said Omar. Jammu, July 20 : Jammu and Kashmir Chief Minister Omar Abdullah said here on Sunday that Prime Minister Narendra Modi should talk to Pakistani authorities to stop ceasefire violations across the border. Omar said today, "We are not worried about China now because they don't harm us anymore. But it has increased from Pakistan's side and is a matter of great concern as they are hampering life. I want the Indian PM to talk to Pakistan authorities that it's not right. Srinagar, July 4 : Prime Minister Narendra Modi met Jammu and Kashmir Chief Minister Omar Abdullah on Friday, after inaugurating a train service from Katra to Udhampur. Earlier today, Modi flagged off a new train to Katra and congratulated the people of Jammu and Kashmir for helping the project see the light of day, and said the new facility will not only be beneficial to Kashmiris, but also to all who want to visit the state. Assuring people that there will be no shortage or obstacles in the development of Jammu, Modi said: "The train is not just to commute, it gives birth to development." Srinagar: Jammu and Kashmir Chief Minister Omar Abdullah today said he was looking forward to work with the new government at the Centre on return of displaced Kashmiri Pandit community to the Valley. "I look forward to working with the new government as they unveil their plans for the honourable return of the displaced Pandit community," Omar wrote on his Twitter account. 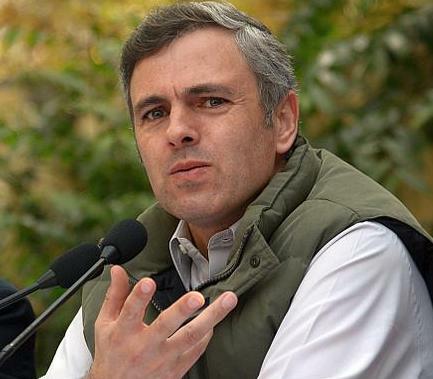 Omar, who could not visit the Kheer Bhawani Temple due to official engagements, extended greetings to the Kashmiri Pandit community on the Kheer Bhawani Festival being celebrated today. BJP's three main manifesto promises, viz. common civil code, Ram Mandir, and article 370, are to deceive voters, Jammu & Kashmir Chief Minister Omar Abdullah said on Monday. 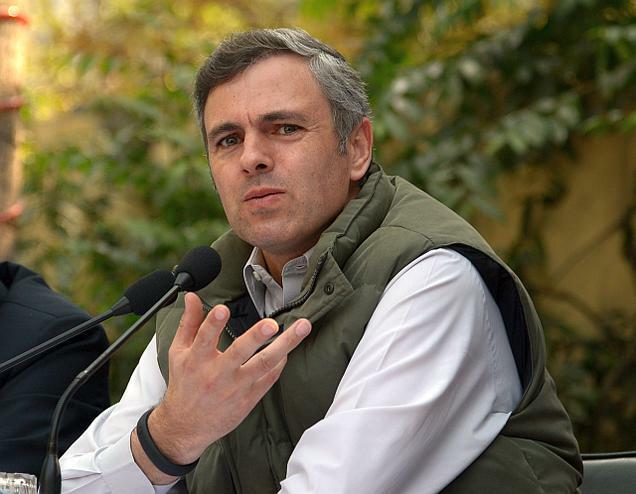 Omar Abdullah said that BJP was not serious about fulfilling any of the three controversial manifesto promises. He argued why BJP didn't pay any heed to fulfill the promises when it was in power. Srinagar, March 26 : BJP Prime Ministerial candidate Narendra Modi has been playing fast and loose with the truth, Jammu and Kashmir Chief Minister Omar Abdullah said Wednesday. Reacting to Narendra Modi's speech at Hira Nagar in Kathua district of Jammu region where Modi launched BJP's poll campaign in the state, Omar tweeted: "NaMo certainly plays fast and loose with the truth. He quotes me and can't even get that right. Modi Sahib please quote me but do it right." Omar also said he has not watched Modi's rally on the television. 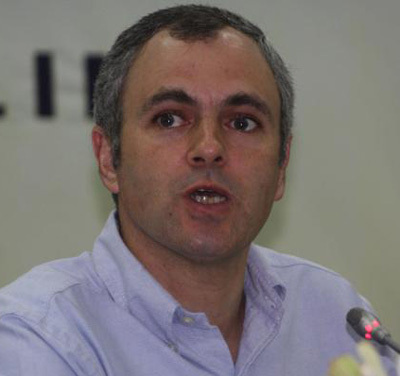 Jammu, March 24 : Jammu and Kashmir Chief Minister Omar Abdullah Monday lashed out at the Bharatiya Janata Party (BJP) for denying ticket to its senior party leader Jaswant Singh. Omar accused the BJP of denying nomination to people who, according to him, are gentlemen and giving election tickets to those he believes are goons. The chief minister also warned Indians to be cautious of this trend which he believes is dangerous. Srinagar, Dec 17 : Jammu and Kashmir Chief Minister Omar Abdullah Tuesday said his government has equipped people of the state with laws and powers to fight corruption in public life. Addressing a public meeting at south Kashmir's Tral town in Pulwama district, 35 km from here, he said: "We empowered people legally to scan government functionaries from the chief minister to the lowest-ranking official by re-constituting the accountability commission (AC), constituting the state commission under the RTI Act and the vigilance commission (VC).